Bangkok has an abundance of many things and rooftops bar is certainly one of them. You don’t have to go far before you will find a hotel or restaurant that claims to offer fantastic views across the city. Of course this may be true and indeed in many cases it is, but not all are what they claim. Below is our list of some of best rooftop bars in Bangkok. Probably the best known rooftop bar in Bangkok and the one that is at the top the most lists. The Vertigo Bar is an alfresco restaurant that sits 61 floors above the chaos below. The bar oozes class and chic and has its own fair share of romance thrown in. This is a great place to enjoy a cocktail or perhaps even a glass of champagne. The views are stunning looking back across the city or alternatively across the river. 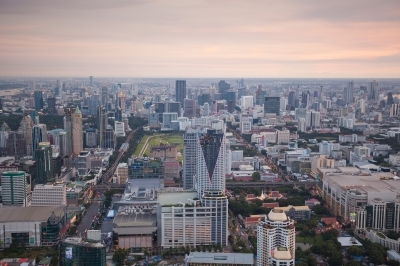 The Three Sixty has, as you probably have guessed, 360 degree views of the many districts of Bangkok. Watch the world go by from the 32nd floor, take in the romantic ambience and enjoy the jazz. You can really see why this appeals to Bangkok’s Hi-So community and international business travellers. The prices are very reasonable too so this is an added bonus. This is a new player in the game and is looking to compete on a different level to other rooftop bars in the capital. In contrast to the rest, the prices are very reasonable (a beer is THB 160) and the whole atmosphere is relaxed and friendly. If you are looking for something that is a little less posh and glitzy -this is the rooftop bar for you. What can you say about the Octave Bar? This is a bar that shows the rest how it should be done. Watch the sunset and enjoy a romantic meal overlooking the Thonglor and surrounding districts of Bangkok. Indeed no other bar in Bangkok has views that match what Octave has to offer with the top floor being split across three levels. Perhaps best known for its mauve colour, The Roof @ 38 Bar is a great place to get away from the hectic Bangkok life. The bar, like many of the others offers stunning views across the city. The only downside of this bar is that it is completely open which is great in cool season but a complete non-starter when the rains come. Sitting 63 floors up, the Sky Bar has long since been a popular rooftop bar. Hollywood has probably helped this but the fantastic 360 degree views certainly add to the appeal. The bar is the perfect place to go to take in a romantic sunset over the Chao Phraya River and this is probably another reason why it makes it on to many visitors ‘to do lists’. The Rooftop Bar is the highest bar in Bangkok and sits on the 83rd floor of the Baiyoke Sky Hotel. Not one for the faint hearted but the magnificent views will make it all worthwhile. The bar is perhaps in need of a little renovation but that doesn’t take anything away from the experience, so grab your favourite drink and take in the views! The lowest of our rooftop bars, the bar at the Baan Wanglang Hotel sits on just the 5th floor but the views are still superb. The actual hotel is located on the Thonburi side of the river and after negotiating Wanglang pier you may still have some difficulty finding the place and it is maybe for this reason why it never seems particularly busy. The bar offers a good range of drinks and snacks as well as offering signature cocktails – all at a price that matches the height of the building, relatively low! Sukhumvit Soi 11 is perhaps one of the main party sois in Bangkok so what better place to take it all in than on the 32nd floor of the Fraser Suites looking down on all the action below. Like many on the others on our list, Above Eleven is a great place to experience the sunset but it offers something slightly different in the form of Peruvian-Japanese inspired dishes. The bar is perfectly located, less than 10 minutes walk from Nana BTS station. The Speakeasy Hotel Muse really gives of the feel of being back in the 1920’s with exquisite cocktails and soft jazz playing in background. Luckily, this isn’t in a time of Prohibition and the bar is not smoke filled but instead gives a feel of being extremely trendy and funky. The drinks on offer are just as appealing as the views so it is well worth seeing what it is all about if you are in the area.